Photograph taken by Estelle Cremers. Courtesy of the Pennsylvania Historical and Museum Commission. 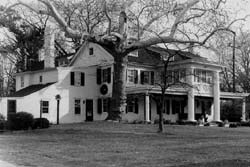 White Horse Farm, built around 1770, was the lifetime home of politician and prominent abolitionist Elijah Pennypacker (1802-1888) and a depot on the Underground Railroad. In 1831 Pennypacker was elected to the House of Representatives and lobbied on the passage of bills concerning commerce, education, and transportation. In 1839, Pennypacker decided to end his political career in order to fully aid the antislavery cause. He became active in various antislavery societies, spoke widely against slavery and became one of most influential leaders of Pennsylvania's abolitionist cause. In 1840 he opened his home as a major stop on the Underground Railroad. Hundreds of fugitive slaves from three different routes, coming from neighboring counties and Delaware, were directed to White Horse Farm. 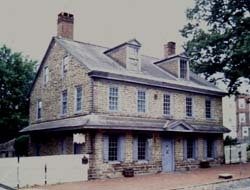 Pennypacker personally transported slaves from his home to Norristown and other points to the north and east. No slaves were ever apprehended while in his care. John Greenleaf Whittier, another celebrated abolitionist, said of Pennypacker, "In mind, body, and brave championship of the cause of freedom, he was one of the most remarkable men I ever knew." After slavery ended, Pennypacker attempted to rejoin politics. As a member of the Prohibitionist Party, he unsuccessfully ran as state treasurer of Pennsylvania in 1875 which marked the end of his political career. White Horse Farm is located in Schuylkill Township, Pennsylvania on Whitehorse Road. The property is a private residence and is not open to the public.